Modern oncology aims at patient-specific therapy approaches, which triggered the development of biomedical imaging techniques to synergistically address tumor biology at the cellular and molecular level. PET/MR is a new hybrid modality that allows acquisition of high-resolution anatomic images and quantification of functional and metabolic information at the same time. Key steps of the Warburg effect-one of the hallmarks of tumors-can be measured non-invasively with this emerging technique. The aim of this study was to quantify and compare simultaneously imaged augmented glucose uptake and LDH activity in a subcutaneous breast cancer model in rats (MAT-B-III) and to study the effect of varying tumor cellularity on image-derived metabolic information. Methods: For this purpose, we established and validated a multimodal imaging workflow for a clinical PET/MR system including proton magnetic resonance (MR) imaging to acquire accurate morphologic information and diffusion-weighted imaging (DWI) to address tumor cellularity. Metabolic data were measured with dynamic [18F]FDG-PET and hyperpolarized (HP) 13C-pyruvate MR spectroscopic imaging (MRSI). We applied our workflow in a longitudinal study and analyzed the effect of growth dependent variations of cellular density on glycolytic parameters. Results: Tumors of similar cellularity with similar apparent diffusion coefficients (ADC) showed a significant positive correlation of FDG uptake and pyruvate-to-lactate exchange. Longitudinal DWI data indicated a decreasing tumor cellularity with tumor growth, while ADCs exhibited a significant inverse correlation with PET standard uptake values (SUV). Similar but not significant trends were observed with HP-13C-MRSI, but we found that partial volume effects and point spread function artifacts are major confounders for the quantification of 13C-data when the spatial resolution is limited and major blood vessels are close to the tumor. Nevertheless, analysis of longitudinal data with varying tumor cellularity further detected a positive correlation between quantitative PET and 13C-data. Conclusions: Our workflow allows the quantification of simultaneously acquired PET, MRSI and DWI data in rodents on a clinical PET/MR scanner. The correlations and findings suggest that a major portion of consumed glucose is metabolized by aerobic glycolysis in the investigated tumor model. Furthermore, we conclude that variations in cell density affect PET and 13C-data in a similar manner and correlations of longitudinal metabolic data appear to reflect both biochemical processes and tumor cellularity. The new paradigm in oncology is to tailor therapies for patient-specific phenotypes, which triggered the invention of powerful hybrid imaging modalities that address tumor biology in greater depth. PET/CT (positron emission tomography/computed tomography) has become commercially available at the beginning of this century and is currently the work-horse in clinical routine for diagnosis, staging, monitoring of response to treatment and outcome prediction of cancer patients. During the last decade, PET/MR has been introduced as a promising new hybrid modality that is potentially superior to PET/CT . This is mainly because MR has an excellent soft-tissue contrast that is not available with CT and delivers accurate high-resolution anatomical images close to CT resolution and without additional radiation exposure. Furthermore, it allows quantitative functional imaging (fMRI), diffusion-weighted imaging (DWI) and metabolic imaging with hyperpolarized 13C-labelled metabolites [2-5]. One of the main hallmarks of tumors that can be addressed non-invasively with metabolic imaging is the Warburg effect [6, 7]. Solid tumors consume abnormally high levels of glucose and catabolize it through inefficient glycolysis, which is an ubiquitous feature of tumors that malignant cells benefit from, e.g., through fast energy production . Pyruvate is the final product of glycolysis and the nexus of the entire metabolic network. Even under normoxic conditions, it is mainly reduced to lactate by fermentation rather than oxidized [9-13]. 2-deoxy-2-fluoro-D-glucose (FDG) is an established clinical PET tracer that can be used for qualitative and quantitative characterization of tissues with high energy demands [14, 15]. Like glucose, it is taken up from the blood stream by glucose transporters and phosphorylated by hexokinase once it is internalized. FDG is finally trapped and accumulates in the cytosol because it is not amenable to the subsequent glycolytic enzymes . Currently, FDG-PET is an established method for staging in clinical oncology and it is widely used on PET/CT scanners that deliver anatomical localization at the same time . However, it requires complementary approaches to better characterize malignant tissues, because FDG uptake is an indirect measure of the Warburg effect. Furthermore, it cannot discriminate between tumors and tissues that consume high amounts of glucose on a regular basis like in the brain, heart or during inflammatory processes [13, 18]. Magnetic resonance spectroscopic imaging (MRSI) has classically been used to study biochemical processes non-invasively, although it suffers from a low sensitivity and requires long scan times . The invention of hyperpolarization (HP) techniques has shifted these limits, allowing signal enhancements of 13C-labelled metabolites by more than five orders of magnitude . However, hyperpolarized signals decay with the spin-lattice relaxation time (T1) which is on the order of a few tens of seconds, limiting the time available for signal acquisition and requiring fast signal acquisition. Furthermore, supra-physiologic concentrations of 13C-metabolites are administered to achieve analyzable in vivo spectra in pre-clinical and clinical  studies. In fact, this could potentially bias the quantification of metabolic parameters, but Serrao et al. have recently shown that exchange rates are not significantly altered by high metabolite concentrations in the blood stream . Hyperpolarized [1-13C]pyruvate (pyruvate) is most often used in vivo, because of its key role in glucose metabolism, its fast metabolic conversion to lactate, its high achievable polarization level and a relatively long T1 . Tumors readily internalize and metabolize pyruvate to lactate by lactate dehydrogenase (LDH-A). The expression of LDH-A is upregulated in many tumors, which results in an increased pyruvate-to-lactate conversion  that can be quantified with MRSI . So far, only a few sites worldwide attempted to assess the flux of glucose through the glycolytic pathway either sequentially or simultaneously with FDG-PET and pyruvate imaging (HyperPET [25-28]). Witney et al. demonstrated a late treatment effect  and Menzel et al. showed a qualitative correlation between both imaging modalities. Ravoori et al. recently detected an early treatment response with pyruvate that was not observed with PET/CT . However, these studies indicate that sequential imaging of FDG uptake and pyruvate-to-lactate conversion with different modalities might not be ideal, because the metabolic status of an organism could change drastically during transport of animals, if the delay between the experiments is too long, or if anesthesia is interrupted. Precise temporal and spatial correlation of complementary PET and MR data can inherently be achieved with PET/MR. However, it is a relatively expensive modality and not a standard technique in preclinical and clinical research. Although it has been shown that co-registration of sequentially acquired PET and MR images is feasible, for instance in brain , PET/MR is particularly useful for regions of low CT contrast. In addition, the ability to perform diffusion-weighted imaging could benefit data interpretation as variations of the cell density might lead to apparently decreased tracer uptake or conversion, affecting quantification of PET and MRSI data . In this study, we established and validated a workflow at a clinical whole-body PET/MR for the multiparametric characterization of the glycolytic flux in a pre-clinical MAT-B-III breast cancer model. We analyzed the in vivo correlation of FDG uptake with pyruvate-to-lactate conversion and performed a longitudinal study with a group of tumor-bearing rats to study the effect of changing tumor cellularity on metabolic PET and MRSI data. All chemicals were used as purchased without further purification. Cell culture media (RPMI-1640 and Mc Coy's) were obtained from ThermoFisher Scientific (Waltham, MA, USA) and medium supplies (fetal calf serum, penicillin/streptomycin mixture) from Biochrom/Merck (Berlin, Germany). [1-13C]pyruvate, OX063 ((tris(8-carboxy-2,2,6,6-tetra-(hydroxyethyl)-benzo-[1,2-4,5]-bis-(1,3)-dithiole-4-yl)-methyl sodium salt) and gadolinium chelate (Dotarem) for hyperpolarization were respectively obtained from Cambridge Isotope Laboratories (Tewksbury, MA, USA), Oxford Instruments (Abingdon, United Kingdom) and Guerbet Laboratories Ltd. (Villepinte, France). Isoflurane was purchased from CP-Pharma (Burgdorf, Germany). Pentobarbital (Narcoren) was purchased from Merial (Lyon, France). Chemicals for the dynamic nuclear polarization (DNP) dissolution buffer were obtained from Sigma Aldrich (St. Louis, MO, USA). FDG was synthesized on site using a standard technique modified from the synthesis reported by Hamacher et al. and with chemicals purchased from Sigma Aldrich (St. Louis, MO, USA). Animal experiments were approved by the local governmental committee for animal protection and welfare (Tierschutzbehörde, Regierung von Oberbayern). Subcutaneous tumors were induced at the right flank of eleven female Fischer344 rats (age = six weeks, average weight = 146 ± 10 g; Charles River, Wilmington, MA, USA) by implantation of 1×106 MAT-B-III 13762 breast cancer cells derived from mammary adenocarcinoma (ATCC, Manassas, VI, USA). For this purpose, cells were cultivated in RPMI-1640 medium supplied with 10% fetal calf serum, 1% penicillin and 1% streptomycin and re-suspended in 200 µL Mc Coy's 5A medium for implantation. A tumor growth curve can be found in Figure S1. For quantitative validation of FDG uptake measured in a clinical PET/MR scanner, three animals were imaged eight days after tumor implantation in a small-animal PET/CT scanner (Inveon, Siemens Healthcare, Erlangen, Germany) after two hours of fasting. Approximately ten hours later, the same animals were imaged again after two hours of fasting in a clinical 3T PET/MR scanner (Biograph mMR, Siemens Healthcare, Erlangen, Germany). Furthermore, eight animals were measured in the clinical PET/MR scanner eight, ten and thirteen days after tumor implantation in a longitudinal study (fed ad libitum). One hyperpolarized [1-13C]pyruvate measurement was excluded from analysis because of respiratory problems during tracer injection, one PET scan failed (see workflow) and one animal was sacrificed on day ten, because it met a study abortion criterion. In total, ten comparable FDG-PET, HP [1-13C]pyruvate and DWI measurements for day eight, eight for day ten and six for day thirteen were used for analysis and clustered into three groups of similar ADC values. For PET/MR scans, animals under anesthesia (1-3% isoflurane) were placed right lateral and head first with the tumor in the middle of the isocenter of the magnet and on top of the center of a flexible 1H/13C dual-tuned transmit-receive surface coil (Rapid Biomedical, Rimpar, Germany). PET scans were started with tail-vein injection of FDG. Multimodal imaging workflow (A) and addressed metabolic pathways (B). Dynamic 90 min PET acquisition was started with tail-vein injection of [18F]FDG. Simultaneously, magnetic resonance-based attenuation correction ultra-short echo time (MRAC UTE), 3D and 2D T1- and T2-weighted proton MRI for determination of tumor localization and slice positioning of 13C and DWI acquisition were performed. Dynamic 13C-MRSI was measured after injection of HP pyruvate at the end of the PET scan (70-90 min after FDG injection). DWI was performed after PET acquisition. Metabolic parameters (glucose uptake and LDH activity) and structural parameters (tumor cellularity) that were addressed with PET, MRSI and DWI are given in bold. Acquisition times are indicated with black solid lines. Acquisition parameters for proton MRI can be found in the supplement (Table S1). Metabolic pathways (B) that were addressed with FDG-PET and 13C-MRSI are colored in red and blue, respectively. Note that arrows with bigger fonts indicate an increased metabolic flux as observable for various tumors. During PET acquisition (Figure 1A), a magnetic resonance-based attenuation correction ultra-short echo time (MRAC UTE), a 3D T1 magnetization-prepared rapid acquisition gradient echo (MPRAGE), a 3D T2-weighted fluid-attenuated inversion recovery (FLAIR), an axial 2D T1-weighted (FLASH) and an axial 2D T2-weighted half Fourier acquisition single shot turbo spin echo (HASTE) sequence were acquired. Metabolic imaging using pyruvate was performed at the end of the PET scan (~70-90 min after PET start) using an axial 2D chemical shift imaging sequence (CSI). For diffusion-weighted imaging, a 2D axial spin-echo, echo-planar imaging (EPI) sequence was applied. DWI was started after the PET scan was finished, because the sequence attempted to move the slice position in the isocenter of the bed, which interfered with PET acquisition. All 2D sequences were positioned in the same axial center of the tumors. Acquisition parameters of the proton MRI sequences are summarized in the supplement (Table S1). During PET/MR acquisition, blood oxygenation (Expression MR Patient Monitor, Invivo, Gainesville, FL, USA) and breathing rate (ECG Trigger Unit, Rapid Biomedical, Rimpar, Germany) were continuously monitored. With exception of one animal that stopped breathing (for about 60 s and then resumed breathing) after injection of pyruvate, breathing (50 ± 13 min-1) and blood oxygen saturation (93 ± 6%) did not show any abnormalities during all performed experiments. Blood glucose (cGlc) and blood lactate (clac) were determined before each measurement (Accutrend Plus, Roche, Basel, Switzerland). The average time of animals under anesthesia was 155 ± 27 min. Quantification of metabolic and cellular parameters was performed for whole tumor ROIs. Detailed information will be given in the respective image analysis sections. The threshold for the region grower for PET analysis was chosen to cover the whole tumor in three dimensions including areas of lower FDG uptake. The acquisition slices of 13C-images were oriented in the axial direction with the slices being in the middle of the tumors and having a slice thickness of 13 mm to cover the tumor in the axial direction. ROIs for 13C-analysis were defined for the whole tumor in T2-weighted images overlaid on 13C-images. For diffusion-weighted imaging, three images (per b-value) with a slice thickness of 3 mm and a distance of 2 mm (total volume: 13 mm) between the slices were acquired to cover the same tumor volume as was measured with 13C-CSI. For histology, four slices per tumor were analyzed with a total distance of 7-10 mm between the two slice pairs. FDG-PET scans in the small-animal PET/CT were started with a tail-vein injection of FDG (11.5 ± 0.6 MBq). Three-dimensional PET data were acquired in list mode for 60 min followed by a CT-acquisition (low dose, 120 projections, 200 ms exposure time, 80 kVp (peak kilovoltage) x-ray voltage, 500 µA anode current at 220° rotation). Images were reconstructed in 12×10 s, 6×30 s, and 11×300 s frames using an ordered-subsets expectation-maximization 3D algorithm with 2 iterations and 16 subsets, followed by 18 maximum-a-posteriori iterations (recommended parameters from manufacturer), without attenuation or scatter correction. The final image matrix was 128×128 pixels, 159 axial slices and a pixel size of 0.77×0.77×0.80 mm3. The CT images were reconstructed with a modified Feldkamp algorithm yielding image matrices of 256×256 pixels, 384 axial slices and a pixel size of 0.17×0.17×0.17 mm3. 3D FDG-PET data were acquired in list mode for 90 min after tail-vein injection of FDG (10.5 ± 2.1 MBq). Images were reconstructed with the same framing as described for PET/CT, using a fully iterative 3D OSEM (ordered subset expectation maximization) algorithm (3 iterations and 21 subsets as recommended by the manufacturer) with an ultra-short echo time magnetic resonance imaging-based attenuation correction (MRAC UTE). The final PET image matrix contained 344×344 pixels, 127 axial slices, and a voxel size of 1.04×1.04×2.03 mm3 resulting in a FOV of 359×359×258 mm3. PET analysis was performed in Matlab (The MathWorks, Natick, MA, USA). Tumor ROIs were semi-automatically segmented using a region grower algorithm with the initial seed manually selected. We calculated the standard uptake value (SUV) in the tumor ROI by normalizing the mean activity concentration in the ROI by the injected dose and the animal weight. All voxels, in which we measured an FDG activity greater than half of the maximum SUV (SUVmax) were appended to the ROI by the region grower (SUVmean, with SUV > 0.5×SUVmax). The threshold was chosen in order to cover the whole tumor including areas of lower FDG uptake. All SUV values were measured on a 5 min frame 47 min post injection. In addition, we calculated the total volume of voxels with SUVmean > 0.5×SUVmax which is defined as the tumor metabolic volume (TMW). The product of the SUVmean and the TMW is the total lesion glycolysis (TLG). Both TMW and TLG are a measure of the metabolic burden [35, 36]. For PET Patlak  analysis, image-derived input functions (IDIFs) were segmented semi-automatically with a threshold of 0.7×SUVmax in the inferior vena cava in coronal images obtained from PET/CT and PET/MR. The average ROI size was 21 ± 10 mm3. Tumor time-activity curves were fitted to a Patlak kinetic model (fit intervals: 10 min to 40 min) yielding the composite rate constant Ki (K1×k3/(k2+k3)), with k1 being the primary tracer uptake rate from blood to free tracer in tissue, k2 the tissue clearance rate and k3 the rate of exchange between free and trapped tracer in tissue. The rate of tumor glucose uptake (MRGlu) was calculated as Ki×(cGlc/LC), with LC being the lumped constant equaling 0.60 . For PET/MR longitudinal data, Ki and MRGlu values were divided by a correction factor f = 2.7 that was obtained from the comparison of PET/CT and PET/MR data. More detailed information for Patlak analysis can be found in the supplement (Section S2 and S3). For the HP process, 14 M [1-13C]pyruvate (36.7 ± 1.9 mg) supplemented with 15 mM OX063 trityl radical and 1 mM Dotarem were polarized with a HyperSense (Oxford Instruments, Abingdon, United Kingdom) for ~30 min at 1.2 K using a microwave frequency of 94.155 GHz and 100 mW power. The sample was dissolved in a solution pressurized to 10 bar and heated to 180 °C containing 4.5 ± 0.3 mL 100 mM phosphate buffered saline (PBS) supplemented with 100 mM sodium hydroxide (NaOH) and 0.1 g/L sodium ethylenediaminetetraacetic acid (EDTA). Finally, the solution for injection contained an average pyruvate concentration of 90.3 ± 3.9 mM at pH 7.6 ± 0.2. The polarization level was about 38% (measured at B0 = 1 T, Spinsolve Carbon, Magritek, Aachen, Germany) . The hyperpolarized solution was rapidly transferred to the clinical PET/MR scanner and injected 21.7 ± 2.1 s after dissolution. The excitation profile of the 1H/13C surface coil was measured as shown in Figure S4. Prior to the in vivo experiments, the 13C-resonance frequency was determined and a calibration of the B1-field was performed using a 5 mL model solution containing 2.2 M [1-13C]lactate (lactate), 5 mM Dotarem and 0.1% sodium azide. The 13C-transmit frequency was set to the center between lactate and pyruvate. CSI was started at the same time as the injection of 1.0 ± 0.1 mL of hyperpolarized pyruvate and injection took 18.0 ± 5.1 s.
A slice-selective, 2D phase-encoded CSI sequence was applied with the following parameters: 3 kHz spectral bandwidth; 512 acquisition points; 5.9 Hz spectral resolution; 8×8 matrix size; 13 mm slice thickness; 8 cm FOV; 15° flip angle; 200 ms repetition time; 29 excitations; 5.8 s scan time per slice; 20 consecutive measurements/scan; 118 s total acquisition time, 10×10×13 mm3 nominal voxel size. The k-space was sampled in elliptic order from the center on outwards. For qualitative comparison of PET and 13C-images, a CSI image with a separate animal that was not used for quantitative analysis was measured using a matrix size of 16×16 and nominal resolution of 0.5×0.5×13 mm3. Number of excitations and scan time were 128 and 28 s respectively. All other acquisition parameters were not changed. Images were reconstructed as described previously (Matlab, The MathWorks, Natick, MA, USA) . The data were zero-filled by a factor of four in both k-space space dimensions and by a factor of two in the temporal dimension prior to Fourier transformation. In the spectrum of each voxel and for each time step, the resonances of lactate and pyruvate were quantified by integration. where rinj. is the rate of injection, tarr. is the time of substrate arrival and tmax,pyr is the time at the observed maximum of pyruvate. We found that fitting of the lactate signal with the following differential equation was more reliable than using the input function parameters obtained by the pyruvate fit. This was mainly due to the fact that the sampling rate of 13C-data was not high enough to accurately determine the actual tmax,pyr. For discrete values, the simplified differential Equation 4 can be expressed as matrix equation for kpl and T1lac,eff. and solved using the Moore-Penrose pseudoinverse. with I(lactate)tumor and I(pyruvate)tumor being the summed mean lactate and pyruvate nuclear magnetic resonance (NMR) integrals observed in the same tumor ROIs as mentioned above. Additionally to analysis of tumor ROIs, we analyzed mean pyruvate and lactate integrals measured in the whole axial CSI slice, which is similar to a slice-selective excitation approach yielding kpl,slice and AUC ratiosslice. This avoids errors of manual ROI determination but instead includes pyruvate and lactate signals from regions outside of the tumor. with S0 being the image signal intensity without diffusion-weighting and b being the diffusion-weighting factor. Calculations were performed using least squares fitting and calculations resulted in pixelwise ADC-maps (MATLAB, MathWorks, Natik, MA, USA). The ADC values were obtained at first by averaging the signal intensities in the manually segmented ROI and subsequently calculating the ADC value. The workflow was performed for three slices per animal to cover the whole tumor in the axial direction. Finally, a weighted mean of three slice-specific ADC values per animal was determined [43, 44]. A representative series of T2-weighted images, diffusion-weighted images and ADC fits are shown in the supplement (Figure S5). Seven animals from terminal experiments were sacrificed with an excess of pentobarbital (n = 1 and n = 6, respectively, ten and thirteen days after tumor implantation). One animal was left out for analysis, because the PET scan failed as described in the workflow section. Tumors and adjacent tissue were removed, marked according to their spatial orientation and divided in two halves that were subsequently fixed in 10% neutral-buffered formalin solution for 48 h, dehydrated under standard conditions (Leica ASP300S, Wetzlar, Germany) and embedded in paraffin. Each half was flattened and from each half two 2 um-thin sections, separated by 200 µm and with a distance of 7-10 mm to the slices from the other tumor half (distance of the outer slices) were prepared with a rotary microtome (HM355S, ThermoFisher Scientific, Waltham, MA, USA), collected and subjected to histological analysis. Hematoxylin-Eosin (H.-E.) staining was performed on deparaffinized sections with Eosin and Mayer's Haemalaun according to a standard protocol. The percentage as well as the pattern of necrosis (i.e., large central necrosis vs. multifocal small areas of necrosis) covering the tumor area were evaluated by two experienced pathologists. Representative H.-E. stained images are given in the supplement (Figure S6). Percentages of necrosis are given as mean (± standard deviation) values calculated for all slices (Figure S7). The distance between the vena cava and the center of mass of the tumors (dt-v) was defined in T2-weighted images (RadiAnt Dicom Viewer, Medixant, Poznan, Poland). All data are represented as mean values and standard deviations (std). Correlations for all quantitative parameters were calculated with a two-sided t-test yielding the Pearson product-moment coefficient (R) using GraphPad Prism (GraphPad Software, Inc., La Jolla, CA, USA). Longitudinal data were analyzed with an unpaired two-sided t-test. Values of < 0.3, 0.3-0.5 and 0.5-1.0 were considered as weak, moderate and strong correlations, respectively, according to the guidelines of Cohen  and as reported earlier . The statistical significance levels are indicated by asterisks, *p < 0.05, **p < 0.01, ***p < 0.001, ****p < 0.0001. Tumor-time activity curves measured with pre-clinical PET/CT and clinical PET/MR are displayed in Figure 2A-B. The SUVmax values were 7.4 ± 1.2 and 7.5 ± 0.7 and the SUVmean values were 4.9 ± 0.5 and 4.8 ± 0.6 for the PET/CT and PET/MR respectively, showing no significant difference (t = 47 min, Figure 2C). For kinetic analysis of FDG uptake, image-derived input functions (IDIFs) could reproducibly be measured in the inferior vena cava (see supplement, Figure S2 ) rather than in the aorta where the IDIF was not quantifiable . However, the area under the curve values of IDIFs (Figure S3) were smaller for IDIF measurements at the PET/MR (Figure 2E) compared to the PET/CT (Figure 2D). This caused an overestimation of PET/MR Ki values by a factor of f = 2.7 (Figure 2F). HP pyruvate was readily observed in the vena cava in the first CSI images (t = 5.9 s) after tail-vein injection. Lactate was observed in the subsequent data sets. The maximum signals of pyruvate and lactate in the tumor were observed at 22 ± 4 s and 27 ± 4 s, respectively, after the start of the acquisition. 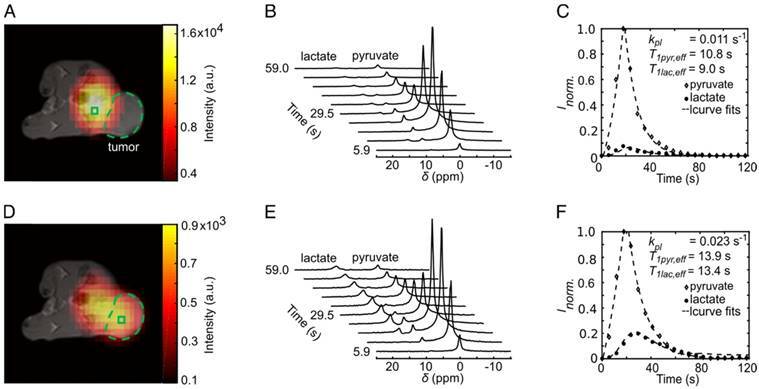 Representative metabolic images of pyruvate and lactate at time t = 23.6 s from a dynamic time course are displayed in Figure 3A and Figure 3D, respectively. The signal of pyruvate was about five-fold higher in the vena cava than in the tumor and about ten-fold higher than the maximum lactate signal. Effective relaxation rates of pyruvate and lactate in tumor ROIs were T1pyr,eff. = 14.6 ± 2.0 s and T1lac,eff. = 9.8 ± 2.5 s (n = 24). Hyperpolarized lactate was mainly visible in tissues around the vena cava and the tumor. AUC ratios and kpl indicated a higher LDH activity in the tumors (AUC ratios = 0.28 ± 0.06, kpl = 0.029 ± 0.009 s-1) than in tissues surrounding the vena cava (AUC ratios = 0.10 ± 0.01, kpl = 0.015 ± 0.004 s-1). The time course of pyruvate and lactate signals of a representative tumor and a non-tumor voxel are shown in Figure 3B and Figure 3E. Respective plots of the integrals of the dynamic NMR series are given in Figure 3C and Figure 3F. Tumor AUC ratios and kpl values showed a strong positive correlation (R = 0.62, p = 0.0012), as reported in the literature . We observed that partial volumes and point spread function  artifacts caused by both a high pyruvate blood signal and a low spatial resolution of 13C-images influenced the tumor kpl and AUC, especially in cases where the tumor was close to the vessel. A positive correlation between the tumor kpl and AUC ratios with the distance of the tumor (dt-v) to the blood vessel illustrates this effect (R = 0.66, p = 0.0004 and R = 0.60, p = 0.0020, respectively, Figure 4A-B). Comparison of the FDG uptake and Patlak analysis of subcutaneous MAT-B-III tumors measured with a pre-clinical PET/CT and a clinical PET/MR scanner. FDG uptake curves of subcutaneous tumors obtained from the (A) PET/CT (blue) and the (B) PET/MR (red). (C) The comparison of SUVmax and SUVmean does not show a significant difference between the two systems. (D-E) are image-derived input functions (IDIFs) used for Patlak analysis measured in the inferior vena cava for PET/CT and the PET/MR images, respectively. (F) shows that the Ki values obtained from PET/MR measurements are overestimated by a factor of 2.7 compared to values obtained with the PET/CT. Note that equal thresholds for the region grower algorithm were used to obtain quantitative PET/CT and PET/MR data (tumor: 0.5×SUVmax, input function: 0.7×SUVmax). Dynamic metabolic mapping of the LDH activity of subcutaneous MAT-B-III tumors using hyperpolarized pyruvate. (A) Static image of hyperpolarized pyruvate at pyruvate maximum in tissues surrounding the vena cava overlaid on an axial T1-weighted image. A non-tumor voxel is indicated with the green box, the tumor is delineated with the green dashed line. (B) Stacked plot of the first ten dynamic 13C-spectra of a non-tumor voxel from (A). (C) Dynamic series of pyruvate and lactate NMR signal integrals from (B) and normalized to the maximum integral of pyruvate (Inorm.). Curve fits are given with dashed lines. (D) Static image of hyperpolarized lactate at lactate maximum overlaid on an axial T1-weighted image. (E) Stacked plot of the first ten NMR spectra from a representative tumor voxel (green box in (D)). (F) Dynamic series of pyruvate and lactate NMR signal integrals of the tumor ROI and normalized to the maximum integral of pyruvate. Curve fits are given with dashed lines. Note that the pyruvate signal was about a factor of ten higher than that of lactate. Correlation between kpl (A) and AUC ratios (B) with distance between the major blood vessel and the center of MAT-B-III tumors (dt-v). Best fit (solid line) and 95% confidence bands (dashed lines). Qualitative comparison of simultaneously imaged FDG uptake and pyruvate-to-lactate exchange in MAT-B-III tumor-bearing rats. (A) Coronal slice of a late frame PET image overlaid on the respective slices of an MPRAGE image. Static axial images of pyruvate (B), lactate (C) and FDG (D) in the same orientation. (E) is the ratio of (C) and (B) showing a higher lactate to pyruvate ratio in the tumor than observed in the surrounding tissue, which correlates well with the high FDG uptake shown in (D). Note that for CSI images, only pixels with a signal > 20% of the maximum signal of hyperpolarized pyruvate and lactate are displayed, respectively. Note further that the pyruvate signal is about a factor of ten higher than the lactate signal and that the nominal resolution of 13C-images was two-fold higher than the resolution used for quantitative analysis. Our PET/MR setup enabled the acquisition of three-dimensional T1- and T2-weighted proton images of whole animals (except the head) with a resolution below one cubic millimeter (Table S1). This allowed an accurate tumor delineation in the axial direction, which facilitated the positioning of 2D proton images that were used for anatomical referencing of MRSI and DWI. Quantification of pyruvate-to-lactate exchange was based on tumor ROI definition on 13C-images overlaid with 2D T2-weighted proton images. Two- and three-dimensional T1-weighted proton images were used for visualization of inherently co-registered PET or MRSI data as shown in Figure 5. A coronal (from 3D T1-weighted images) and an axial static late frame FDG image (t = 55 min) show high FDG uptake in tumors (Figure 5A and Figure 5D). Representative static metabolic images of hyperpolarized pyruvate and lactate are displayed in Figure 5B and Figure 5C revealing pyruvate uptake and conversion to lactate in the same region as given in Figure 5D. Figure 5E displays the ratio of lactate-to-pyruvate and indicates a high pyruvate-to-lactate exchange in the tumor region, which qualitatively correlates well with a high FDG uptake (Figure 5D). We measured 24 multimodal longitudinal PET/MR data sets to investigate the correlation between FDG uptake and pyruvate-to-lactate exchange and the effect of tumor cellularity on metabolic data. However, it has to be noted again that ROIs for PET, DWI and MRSI analysis did not exactly correlate in space, as mentioned in the methods. ADC values significantly increased with tumor growth (Figure S8A) due to increasing necrosis. This was verified by histological analysis (Figure S7) that showed a positive but not significant correlation between ADC and percentage of necrosis for the terminal samples (R = 0.46, p = 0.2150, n = 7). Metabolic data showed a negative correlation with increasing necrosis without significance (SUVmean: R = -0.46, p = 0.2960, Ki: R = -0.68, p = 0.0916), whereas only a very weak trend was observable for 13C-data (kpl: R = -0.23, p = 0.6147). Comprehensive plots are shown in Figure S7. Note, that only small amounts of granulation tissue in the necrotic parts and immune cell infiltration were observed. Based on these observations, we clustered quantitative 13C- and PET data into three groups of low, medium and high ADC values: (0.57 ± 0.04)×10-3 mm2s-1, (0.85 ± 0.09)×10-3 mm2s-1 and (1.22 ± 0.10)×10-3 mm2s-1 (with n = 13, n = 7 and n = 4, respectively). We then analyzed the correlation of quantitative PET and 13C-data of the low ADC group in order to exclude partial volume effects that affect metabolic data caused by a varying tumor cellularity (Figure 6). Tumor kpl exhibited a significant positive correlation with SUVmean (R = 0.59, p = 0.0352, Figure 6A) and Ki (R = 0.57, p = 0.0399, Figure 6C). A similar but not significant trend was observed with SUVmax (R = 0.51, p = 0.0761, Figure 6B) and no correlation was seen with MRGlu (R = 0.05, p = 0.8636, Figure 6D). Tumor AUC ratios significantly correlated with SUVmean (R = 0.59, p = 0.0326, Figure 6E), SUVmax (R = 0.55, p = 0.0498, Figure 6F) and Ki (R = 0.68, p = 0.0103, Figure 6G), but not with MRGlu (R = 0.36, p = 0.2245, Figure 6H). Slice-selective kpl and AUC ratios, excluding errors from manual tumor ROI definition, also showed a positive correlation with quantitative PET data: kpl, slice with SUVmean: R = 0.56, p = 0.0481 and with Ki: R = 0.65, p = 0.0158; AUC ratiosslice with Ki: R = 0.70, p = 0.0079 and with MRGlu: R = 0.81, p = 0.0008. A comprehensive correlation matrix for tumors with a similar ADC can be found in the supplement (Table S2). Longitudinal PET data showed a significant inverse correlation with ADC, while a similar but not significant trend was observed for kpl. No correlation or trend was observed between AUC ratios and ADC. Representative correlation plots of SUVmean and kpl with ADC are given in Figure 7. A comprehensive matrix of Pearson correlation coefficients for longitudinal data can be found in Table 1, excluding slice-selective-like 13C-data analysis (see Table S3). Overall, kpl (Figure S8C) and PET uptake (SUVmean, SUVmax, Ki and MRGlu) apparently decreased (Figure S8D-G) for bigger tumors. With tumor growth, the tumor metabolic volumes (TMW, Figure S8H) and the total lesion glycolysis (TLG, Figure S8I) increased and showed a strong correlation with ADC values (R = 0.81, p < 0.0001; R = 0.73, p < 0.0001, respectively, Table 1) and with the blood lactate concentration (R = 0.60, p = 0.0020; R = 0.51, p = 0.0118, respectively; Table 1 and Figure S8J). In addition, we detected an inverse correlation of PET SUVmean /SUVmax and kpl with blood lactate concentration (R = -0.52, p = 0.0099; R = -0.48, p = 0.0172; R = -0.44, p = 0.0314; Table 1), which increases for animals with bigger tumors. Blood glucose levels slightly decreased but without significance (Figure S8 K). AUC ratios did not change significantly and solely correlated with SUVmean (R = 0.41, p = 0.0484). Similar but not significant trends were observed for their correlations with SUVmax, Ki and MRGlu (R = 0.37, p = 0.0728; R = 0.37, p = 0.0747; R = 0.25, p = 0.2374). For kpl, we observed significant positive correlations with tumor SUVmean /SUVmax (R = 0.67, p = 0.0004; R = 0.61, p = 0.0014) and Ki (R = 0.65, p = 0.0006), which was not detected for MRGlu (R = 0.34, p = 0.1081). ADC: apparent diffusion coefficient; AUC rat: AUC ratios; cglc,: blood glucose concentration; clac: blood lactate concentration; dt-v: distance of tumor to central blood vessel; Ki: composite rate constant; kpl: pyruvate-to-lactate exchange rate; MRGlu: metabolic rate of glucose utilization; n.s. : not significant; SUVmax: maximum standard uptake value; SUVmean: mean standard uptake value; TLG: total lesion glycolysis, TMW: tumor metabolic volume. Correlation plots of FDG uptake and hyperpolarized pyruvate CSI data of tumors with similar ADC values. Correlation of kpl with (A) SUVmean, (B) SUVmax, (C) Ki and (D) MRGlu. Correlation of AUC ratios with (E) SUVmean, (F) SUVmax, (G) Ki and (H) MRGlu. Best fit (solid line) and 95% confidence bands (dashed lines). The mean ADC of analyzed tumors was (0.57 ± 0.04)×10-3 mm2s-1 (n = 13). We established and validated a multimodal imaging workflow on a whole-body PET/MR scanner to characterize the Warburg effect in a pre-clinical tumor model in rats. Using this workflow, we addressed the glycolytic flux in tumors and analyzed the effect of tumor growth on longitudinal metabolic data. Our setup enables the acquisition of high-resolution anatomical images and the quantification of physiological and biochemical data with PET, MRSI and DWI in one scan session. Furthermore, it has potential for translation to large animal models [25, 26, 28] and into the clinic, where it could prove the oncological value of hybrid PET/MR. Correlation of SUVmean (A) and kpl (B) with ADC. Longitudinal data were clustered into three groups (black, red, blue) of different ADC values to analyze the effect of tumor cellularity on metabolic data. Best fit (solid line) and 95% confidence bands (dashed lines). FDG is an important tracer for diagnosis, staging and response to treatment monitoring of malignant tissues . Comparative measurements with the gold-standard for pre-clinical imaging (PET/CT) showed that tumor SUVs (tumor size: >500 mm3) can be measured reliably using a clinical system that has an isotropic spatial resolution of 4.3 mm . However, quantification of FDG uptake could be biased due to false-positive results of glycolytic granulation tissue and infiltrating immune cells . Histological analyses detected only a low proportion of fibroangioblastic granulation tissue consistent with a mesenchymal reaction to tumor implantation, whereas no distinct differences between animals were noticed. Furthermore, only scarce immune cell infiltration (mainly consisting of lymphocytes) surrounding the tumor tissue was observed and only single immune cells were present within the neoplasia (Figure S6). 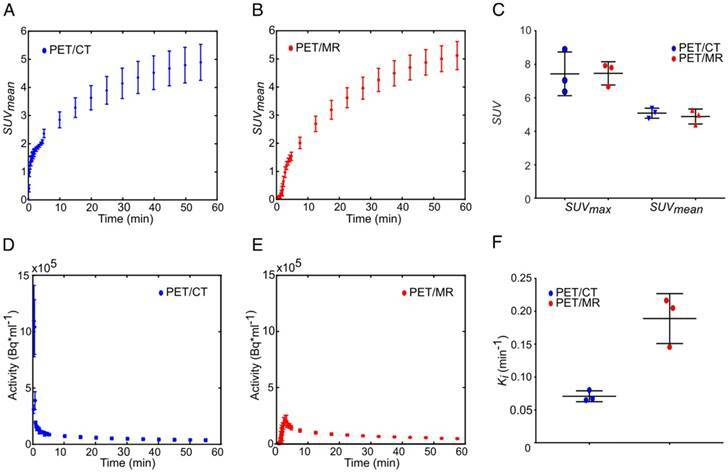 In small structures like the inferior vena cava (~3 mm diameter for rats ), the activity recovery is biased due to partial volume effects, which leads to an overestimation of the composite rate constant (Ki). The spatial resolution of the PET/CT (<1.5 mm ) is about a factor of three higher than that of the PET/MR, allowing a better quantification of the input function and correction of the PET/MR data. However, for future studies we seek to approximate this correction factor more accurately either by measurements with dynamic contrast-enhanced (DCE) MRI  or by invasive arterial blood sampling . Nevertheless, it should be noted that input functions could reproducibly be measured (Figure S2) in the inferior vena cava [47, 48] with a clinical PET/MR, enabling a quantification of tumor glucose consumption (MRGlu) even though values are biased. Chemical shift imaging (CSI) is a reliable sequence to acquire spatially resolved spectroscopic data in vivo. However, CSI requires a single excitation for the acquisition of each position in the k-space for spatial information, and thus results in relatively long scan times and an ineffective use of HP magnetization. Nevertheless, we were able to perform time-resolved CSI measurements with a matrix size of 10×10×13 mm3 and obtained time courses of pyruvate-to-lactate exchange that allowed a quantification of in vivo rate constants of LDH. However, due to the low image resolution, we defined whole tumor ROIs including necrotic areas for analysis. This caused partial volume effects likely yielding smaller apparent rate constants (kpl and AUC). In addition, quantitative LDH measures (Figure 4) were further underestimated due to partial volumes and point spread function artifacts , in particular for the pyruvate signal in the vena cava, likewise caused by the low image resolution. Methods to partially compensate for such artifacts would for instance be the inclusion of an arterial  or image-derived input function for pyruvate. However, we found that due to the low data sampling rate, the latter approach was not as reliable as solving the differential equation (Equation 4) with the pseudoinverse of the matrix equation. At this point it should also be noted that a lower sensitivity of the 13C-coil further away from its surface probably also impeded optimal quantification (Figure S4). In future, implementation of fast state-of-the-art imaging sequences like IDEAL spiral CSI , spectral-spatial EPI  or echo planar spectroscopic imaging (EPSI)  could be used to increase spatial resolution, which will improve the quantification of in vivo 13C-data. In the past, several studies sequentially measured FDG uptake and pyruvate-to-lactate exchange on consecutive days . Menzel et al. noticed that longer delays between experiments might change the glucose metabolism, obscuring the biological significance of metabolic information . Simultaneously acquired FDG-PET and HP-pyruvate MRSI data for tumors with similar cell density herein demonstrated a positive qualitative (Figure 5) and quantitative (Figure 6) correlation between FDG uptake and LDH activity. However, metabolic images from different acquisitions were not precisely matched in space and correlations of quantitative data are probably still biased. In the future, this could be improved by an analysis of ROIs that are identical in space and dimension. Furthermore, provided that the spatial resolution of MRSI could be improved, inclusion of a voxel-wise  or histogram-based analysis could be beneficial to address tumor heterogeneity in greater depth . Our workflow included diffusion-weighted imaging to address changes of tumor cellularity with tumor growth, because variations of tissue density and “tissue organization and extracellular space tortuosity”  can affect image-derived FDG uptake and pyruvate-to-lactate conversion. DWI is an emerging technique in oncology for diagnosis, monitoring and outcome prediction of malignancies. However, the diffusion encoding is inherently sensitive to motion and the imaging readout based on single-shot echo planar imaging (EPI) is prone to image distortions, as partially observed in our study (Figure S5). This could lead to quantification errors. We therefore performed comparative measurements with standardized phantoms, which revealed a good reproducibility of ADC measurements between different systems, yielding values in agreement with the literature (Supplement S5). As ADCs significantly changed with tumor growth, we clustered longitudinal data in three groups of low, medium and high ADC. 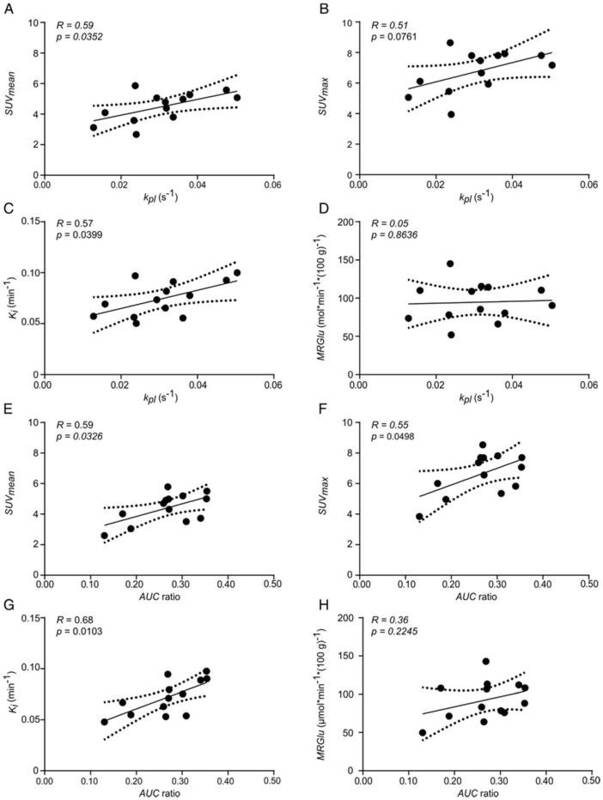 By minimizing the influence of variations in cell density on metabolic data, the correlation of FDG uptake (SUVmean and Ki) and pyruvate-to-lactate exchange indicates that a major portion of consumed glucose is reduced via pyruvate to lactate for the low ADC group. Tumors use oxidative glycolysis to generate fast energy from glucose and fulfill their anabolic needs . The excessive lactate production is crucial for invasion and immune evasion of tumors, facilitating their survival and metastasis . A quantitative measure of the lactate production in tumors (kpl or AUC ratios) is therefore valuable information that is complementary to FDG-PET and will potentially allow a more precise and patient-specific phenotyping. Our setup enables the simultaneous quantification of FDG uptake, LDH activity and tumor cellularity to analyze the impact of tumor tissue density on metabolic data. In fact, negative correlations of longitudinal PET and DWI (Table 1 and Figure 7) data showed that the measured FDG concentration (e.g., SUVmean or Ki vs. ADC) decreases with decreasing tumor cellularity (Figure S8). This was validated by histology (Figure S7) and is in agreement with the literature [33, 60-62]. Similar effects were observed with 13C-data (kpl), but we assume that a rather imprecise quantification caused by a limited spatial resolution of our 13C image obscured the significance. In addition, kpl values appeared to reflect longitudinal averaging effects better than AUC ratios, where no trend was observed for the correlation with ADC. With tumor growth, the overall tumor cellularity decreased while the absolute number of active tumor cells increased. This was indicated by increasing TMW and a strong positive correlation of the respective parameters (ADC and TMW). Thus, the absolute amount of FDG uptake (TLG) and lactate production in tumors both increased, which led to a progressive lactate acidification of animals. This was reflected by an increasing blood lactate concentration (clac) for animals with bigger tumors and its strong positive correlation with TMW and TLG . Finally, longitudinal PET and 13C-data also showed a positive correlation (kpl with SUVmean/SUVmax and Ki, AUC ratios with SUVmean). Taking the results of the low ADC group and the correlations of the longitudinal data with ADC into account, we conclusively assume that this correlation is a combined effect of the Warburg effect and partial volume effects. The simultaneous acquisition of high-resolution anatomical images, DWI, PET and hyperpolarized MRSI data is now possible with hybrid PET/MR in a clinical environment [25, 26, 28]. Better acquisition schemes for fMRI and MRSI and the growing number of approved PET tracers and hyperpolarized probes will further help to characterize tumor biology in greater depth. We established and validated a multimodal imaging workflow for a clinical PET/MR scanner to simultaneously quantify glucose uptake, LDH activity and cell density in rodents with PET, hyperpolarized MRSI and DWI. Despite resolution limitations of dynamic 13C-data, we demonstrated a good correspondence between high glucose uptake and elevated LDH activity in tumors of similar cellularity. This indicates that a major portion of glucose is reduced to lactate in the analyzed tumor model. Longitudinal DWI data showed a decrease in cell density during tumor growth, which affected the quantification of both PET and MRSI data. Our workflow includes a multiparametric and non-invasive tumor characterization that can possibly be applied to larger animal models with potential for clinical applications paving the way for tailored and patient-specific therapy approaches. 2D: two-dimensional in space; 3D: three-dimensional in space; ADC: apparent diffusion coefficient; AUC ratio: areas under the curve ratio from tumor region-of-interest 13C-analysis; AUC ratioslice: areas under the curve ratio from slice-selective like 13C-analysis; B0: static magnetic field; B1: radiofrequency excitation field; b-value: diffusion-weighting factor; cglc: blood glucose concentration; clac: blood lactate concentration; CSI: chemical shift imaging; CT: computed tomography; DCE: dynamic contrast enhancement; DNP: dissolution dynamic polarization; DWI: diffusion-weighted imaging; dt-v: distance between the vena cava and the center of mass of the tumors; EDTA: sodium ethylenediaminetetraacetic acid, EPI: “echo planar imaging; [18F]FDG: 2-deoxy-2-[18F]fluoro-D-glucose; FLASH: fast low-angle shot; FLAIR: fluid-attenuated inversion recovery; fMRI: functional magnetic resonance imaging; FOV: field of view; HASTE: half Fourier acquisition single shot turbo spin echo; H.E. : Hematoxylin-Eosin; HP: hyperpolarized; HyperPET: simultaneous 13C-hyperpolarized magnetic resonance spectroscopic imaging and positron emission tomography; IDIF: image derived input function; I(lactate)tumor: summed mean lactate integrals in tumor ROIs; Inorm. : hyperpolarized pyruvate and lactate signals normalized by the maximum observed pyruvate signal; I(pyruvate)tumor: summed mean pyruvate integrals in tumor ROIs; k1: primary tracer uptake rate from blood to free tracer in tissue; k2: tissue clearance rate; k3: rates of exchange between free and trapped tracers in tissue; Ki: composite rate constant; klp: rate constant for lactate-pyruvate-exchange; kpl: rate constant for pyruvate-lactate-exchange; kpl,slice: rate constant for pyruvate-lactate-exchange measured in the whole CSI slice; kVp: peak kilovoltage; LC: lumped constant; LDH: lactate dehydrogenase; LDH-A: lactate dehydrogenase A; MAT-B-III: mammary breast cancer cells derived from adenocarcinoma; Mlac: observable magnetization of hyperpolarized lactate; MPRAGE: magnetization prepared rapid acquisition gradient echo; MRGLU: metabolic rate of glucose; MR: magnetic resonance; MRAC: magnetic resonance-based attenuation correction; MRI: magnetic resonance imaging; MRSI: magnetic resonance spectroscopic imaging; Mpyr: observable magnetization of hyperpolarized pyruvate; n: number or data points; NaOH: sodium hydroxide; NMR: nuclear magnetic resonance; OSEM: ordered subset expectation maximization; OX063: (tris(8-carboxy-2,2,6,6-tetra-(hydroxyethyl)-benzo-[1,2-4,5]-bis-(1,3)-dithiole-4-yl)-methyl sodium salt); p: significance level; PBS: phosphate buffered saline; PET: positron emission tomography; R: Pearson correlation coefficient; RF: radiofrequency; rinj: injection rate; ROI: region-of-interest; RPMI-1640: Roswell Park Memorial Institute 1640 cell culture medium; S: signal intensity for a defined b-value; S0: signal without diffusion-weighting; std: standard deviation SUV: standard uptake value; SUVmax: maximum standard uptake value; SUVmean: mean of SUVs that are greater than SUVmax multiplied by a defined threshold (0.5 or 0.7) within a ROI; T1: spin-lattice relaxation time; T1lac,eff..: effective relaxation rate of hyperpolarized lactate; T1pyr,eff. : effective relaxation rate of hyperpolarized pyruvate; T2: spin-spin relaxation time; tarr. : time of substrate arrival; TE: echo time; TR: repetition time; TLG: total lesion glycolysis; tmax,pyr: time of observed maximum of hyperpolarized pyruvate; TMW: tumor metabolic volume; UTE: ultra-short echo time; ρlac: effective decay rate of hyperpolarized lactate; ρpyr: effective decay rate of hyperpolarized pyruvate. We acknowledge Birgit Blechert and Michael Michalik for culturing cells, Sylvia Schachoff for her help with the PET/MR and Sybille Reder and Markus Mittelhäuser for performing the PET/CT measurements. C.H. planned experiments, designed the PET/MR workflow, operated the polarizer, wrote and revised the manuscript. M.B. handled animals and B.F. helped with the tumor model. C.M. operated the PET/MR scanner, A. E. H. provided the 13C-CSI sequence and reconstruction scripts. M. S. analyzed DWI data. S.D., F.S. helped with 13C-analysis and J.C. wrote PET analysis software in Matlab. W.W. and K.S. performed histological analysis. S. J. G., A. H., J. B. H, A. K., S.G.N. and M.S. designed the research and revised the manuscript. We thank Cambridge Isotope Laboratories Inc. for providing [1-13C]pyruvate and appreciate support from EU (Grant No. 642773 and 294582) and from the Deutsche Forschungsgemeinschaft (DFG, German Research Foundation): 391523415, 68647618, HO-4604/2-1, SFB 824 and Excellence Cluster No. 306. We further thank the DFG Major Instrumentation Initiative PET/MR. JBH acknowledges support by Kiel University and the Medical Faculty for supporting the Molecular Imaging North Competence Center (MOIN CC) as core facility for imaging in vivo. MOIN CC was founded by a grant of the European Regional Development Fund (ERDF) and the Zukunftsprogramm Wirtschaft of Schleswig-Holstein (Project no. 122-09-053).